Looking to keep track of your inventory. No matter how big or small your inventory is, you can download Free Printable Inventory Count Sheets to monitor your inventory and track your cycle counts. Our printable inventory sheet is available for free download. This sheet makes it easy to count and track inventory levels to ensure accurate and efficient ordering and stocking of goods. The inventory sheets are just one of the hundreds of sheets, spreadsheets, templates and calculators designed to make the life of working folks everywhere just a little easier, one day at a time. So why are inventory count sheets so important? 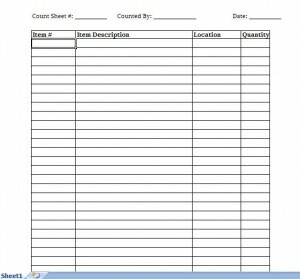 Well, inventory is an important part of many businesses and this blank inventory sheet is a great tool to help ensure an accurate count. Download a free inventory spreadsheet today to get started. Good inventory tracking will help business owners and managers know what items are in stock, what is on order and when new products will arrive. What are the advantages that come with these free printable inventory count sheets? This free inventory spreadsheet will help users formulate their own tracking system to make the process easier and more accurate. When calculating inventory, it’s important to know the amount of goods or products are on hand at any time. Some businesses implement inventory counts less frequently than others – for instance, large companies that spend days doing a single count. Smaller companies and their management staff can take advantage of our printable inventory sheets to perform inventory counts more frequently, making it easier to stay on top of trends and hot-selling products. This inventory sheet is just one of the many inventory tools available on this site. If you enjoy using this inventory sheet template or any of the other templates and spreadsheets that are available across the site, please feel free to share with your coworkers and friends. This page can be shared on Twitter, Facebook or Google Plus! Trying your site recomended by friend.